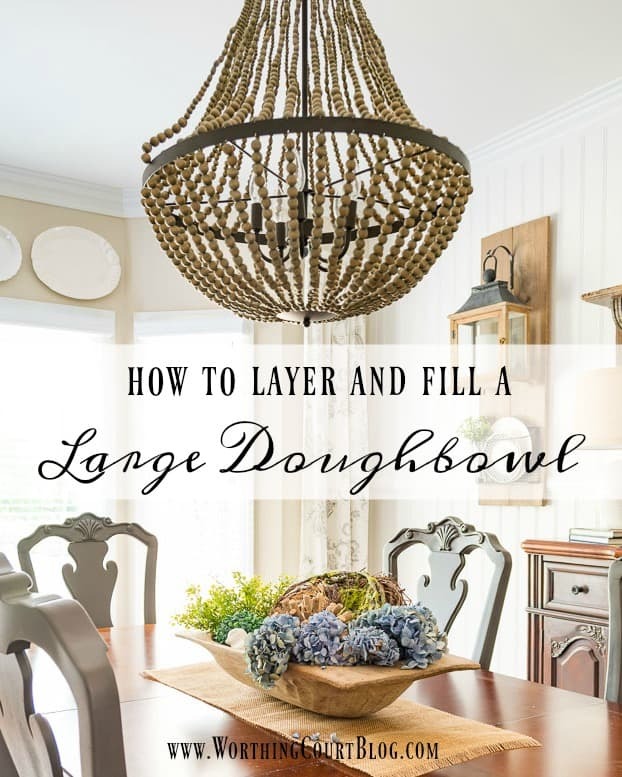 Do you have a dough bowl and are struggling with how to fill it? These step by step directions will take you from an empty bowl to one overflowing with spring and summer goodness! I love my dough bowl today as much as the day that it arrived in the mail and I still get excited with all of the possibilities when I’m ready to fill it! I was on the hunt for one for a long, long time. Sure, they’re easy to find, but finding one at a price that I was willing to pay was a whole ‘nother story. In addition to being budget friendly, I was on the lookout for one that was large, but not humongous and had a level bottom so that it wouldn’t tilt or fall over. I had all sorts of visions of what I could do with it, but when it came time to actually fill it, fear stepped in and froze me right up. I couldn’t think of much else to do with it other than to fill it with twig and faux greenery orbs. I moved it from place to place in my house, with those same ole greenery and twig orbs in it. B-O-R-I-N-G! Speaking of fear – why do we do that? Why do we get so scared that we freeze up and wind up doing nothing? If you have a cure for that, please share! 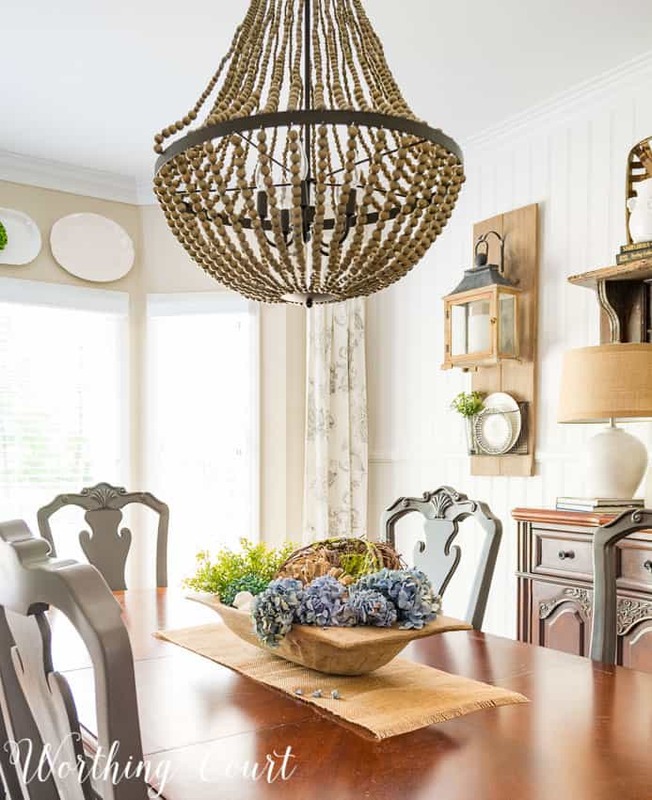 When I was putting the finishing touches on my dining room makeover, I decided to chase fear away and just go for it. And you know what? It wasn’t so hard and scary after all. 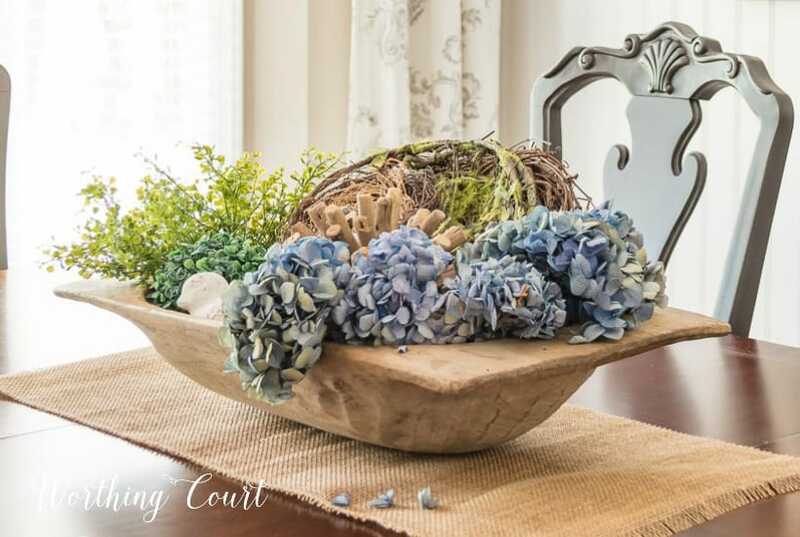 But back to the dough bowl – I needed a spring centerpiece and I wanted one that would carry me right on through the summer, so keeping that in mind, I looked through my stash to see what I could find. I turned all of this stuff…..
…..into this! I played and messed around until I came up with a layered and texture filled arrangement that I loved. All it took was a little time and patience on my part. And being in the right frame of mind helped too. This graphic will show you exactly how I put all of layers together and hopefully help you. The “ingredients” in your dough bowl can easily be adjusted for the holiday or season. LESSON LEARNED: Don’t let fear and indecision freeze you! It turned out great! 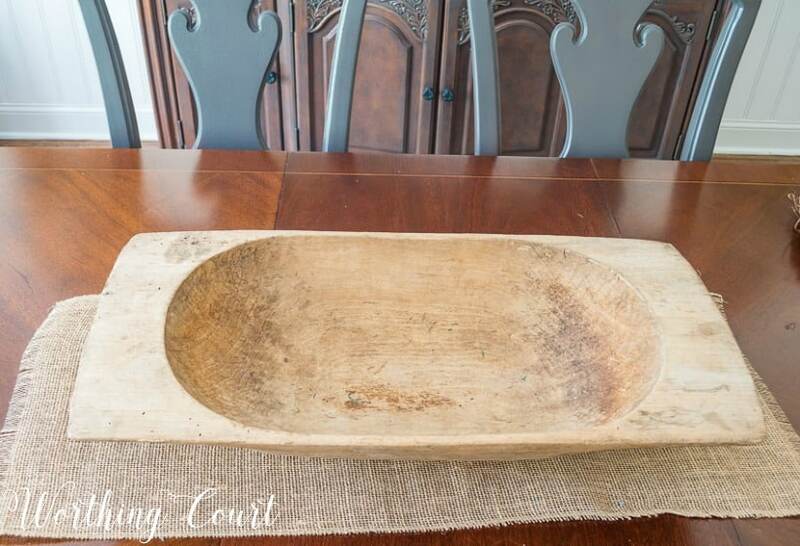 I have been on the hunt for a large dough bowl that is affordable as well. So glad you like it, Penny! Reasonably priced dough bowls are hard to find, especially large ones. Good luck with your search! So right about needing some spring.These grey rainy days here in N.C. are too much. We are better than this N.C.! 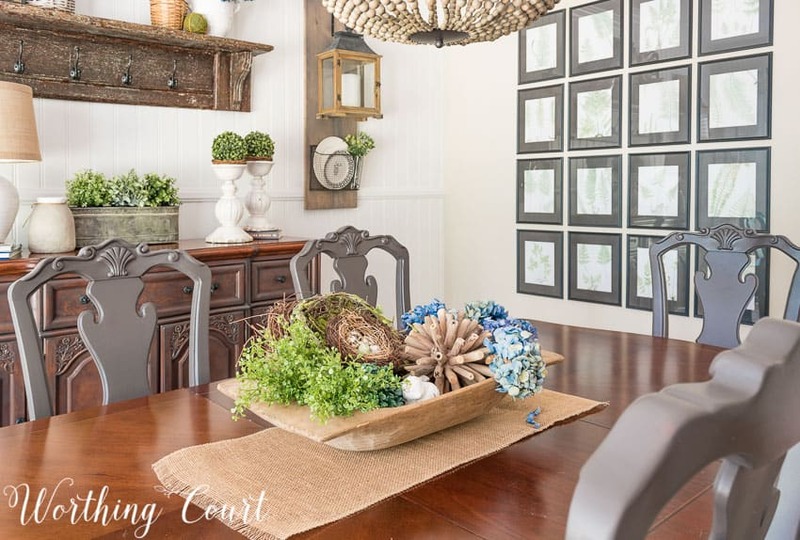 Adding spring decor slowly but every bit brightens my day especially a big bouquet of Daffodils in a blue pitcher on my kitchen counter. Thanks for the tips on dough bowls. I have a long narrow one which remains empty and sitting on a shelf. Actually I am liking the simplicity of it right now. I am sure as we get closer to Easter it will be a vessel for pretty eggs and some spring like bird nests and maybe a bunny or two. Great advice! I love how it turned out. Thank you, Lauren! Glad you like it. That is such a cute dough bowl. I’ll do the same thing sometimes…I’ll have an item and it needs a home. I don’t really mind puttering around in this manner – lots of other inspiration happens along the way. I spent about an hour last week in just this way, looking for just the right spot for an item. I finally chose one. I moved it again today – it was in one of the other spots I’d contemplated. I merely switched places with the other item. I can’t believe I found your wonderful site with such good timing. I just purchased a beautiful dough bowl which I love, but I too, wondered what to do with it. It looked nice empty, but somehow I felt it needed something to make it come alive. Then I found your site and knew exactly what I should do. Not only do I thank you for your idea, but also for such clear instructions on how to do it. You’re a wonderful lady and I’m glad I found you. Hi Louise. You’re so sweet – thank you for your kind words! Have fun playing with your dough bowl! I’ve never heard of a “dough bowl”. Can you tell me more about it? Besides the obvious, which I assume, is that it is intended for dough, lol! 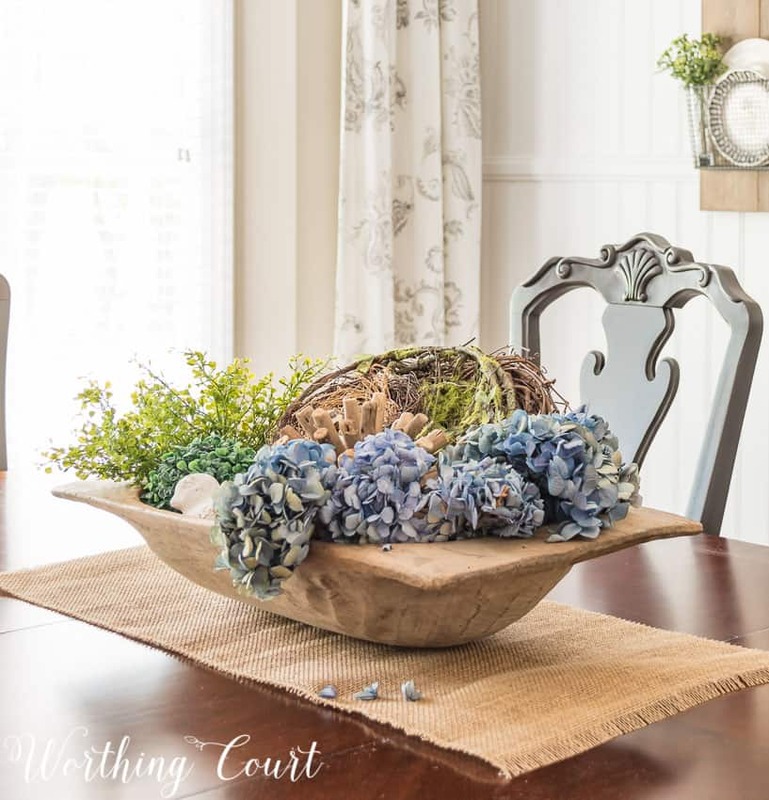 It does make a gorgeous centerpiece! Thanks for sharing at the family joy linkup! So glad I was able to give you some inspiration, Lisa. Those dough bowls can be intimidating! Thank you for the feature! It looks great! And I know exactly what you mean – I was looking for a dough bowl forever and saw so many ways to use it, but then when I got mine, I was at a bit of a loss! So weird! Now I actually have summerized it and it’s filled with shells, but I will do something Fall when next month comes. Ooooh – love the idea of filling a dough bowl with shells. How perfect for summer! Have a great week! I always love your work, but where o’ where did you fined your dough bowl? I see several other people have mentioned they recently found bowls, but haven’t mentioned where they purchased them. I’ve been looking for ages. Also what do you consider a reasonable price point? Thank you. Hi Maggie. I found mine at a local store close to Greensboro, NC. Let me know if you live near here and I’ll be glad to share the name of the store with you. I can’t remember the exact price that I paid, but it was somewhere between $30 – $45. Hi Suzie: I am new (just this morning) to your site. From what I’ve read so far, I’m going to enjoy being a subscriber as your decorating is lovely and your writing style has much warmth. I would LOVE to own a dough bowl but in all my hunting (I live in southern Ontario) I’ve never, ever seen one. A friend of a friend bought one years ago and she paid approximately $150.00 for it! Hi Elaine. I’m glad to have you here and it’s so nice to “meet” you! It’s totally crazy how much most dough bowls cost! I happen to live close to where a furniture market is held twice per year, so I actually found mine at a wholesale place. PS: my apologies, Suzy … I see I spelled your name incorrectly! No worries at all, Elaine! It happens all the time and doesn’t bother me a bit. Have a great day! Thank you for the information on the dough bowl. Unfortunately, I am in Pennsylvania, close but not close enough. Does your store have an on line site? It would be great to order? Depending on shipping costs etc., etc. Hi Margaret. Sadly, the store where I purchased my dough bowl doesn’t have an online site. 🙁 I happen to live where a huge furniture market is held twice per year and found mine at one of the many designer places around town. Let me know if you ever make it down to central NC and I’ll tell you where it is. Thanks for the information on how to fill a dough bowl. I totally agree that we “freeze up” and end up doing nothing. I’ve done that many times and get so frustrated! I like the way you show each step on how to fill it, also. Love reading your blog, keep up the great work! Thanks for the inspiration for the dough bowl. I just bought a nice wooden bowl and this gives me ideas for fall. Love your style and talents! I love your dough bowl ~ and the items you put in it are casually appealing! I’d love to have one ~ I’ve seen many nearby at Canton, Texas’ First Monday … But this vendor has stack after stack of reproductions in various sizes. They frequently are stained dark, even varnished! This is NOT what I want! They don’t even look original. Where can I find a reasonably priced dough bowl? I live near central NC and would like to know the location and times of the furniture market. I love the way you decorated it. When I freeze, I start putting stuff together and then I get an idea on what I like and don’t like and go from there. Hi Sandra. You just might live near me! I’m in Greensboro. The store where I found my dough bowl is called Golden Oldies and is in downtown High Point. They prefer cash. The Furniture Market is held twice a year – usually in October and April. How pretty! I love hydrangeas!! Have been hunting a dough bowl myself! Wow, are they expensive. Love yours, but am still on my quest. I just drag my stash box in when I’m trying to change, update, or try a new style and go for it. I know what you mean with the anxiety about doing a spot, but gosh, it always turns out to be a real experience. And once you get the end result you like, it’s very satisfying. What a great job of decorating you do! Love your style. 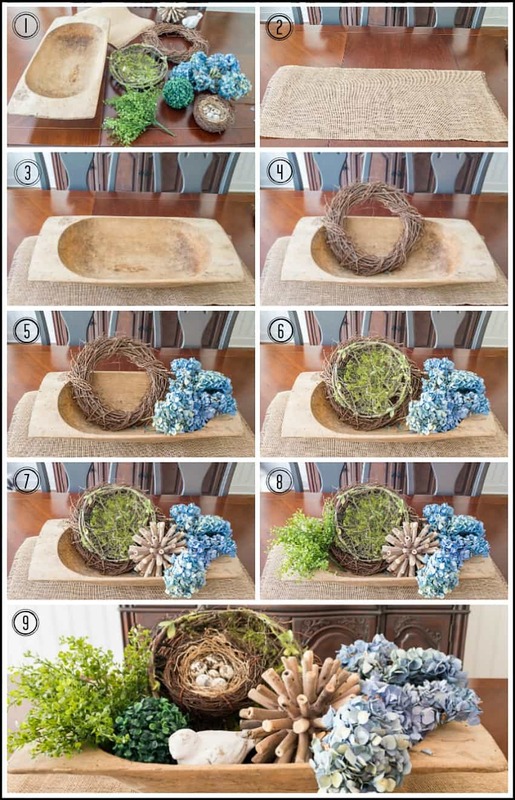 Thanks for the great step by step lesson for arranging a bowl or basket for display. It really looked easy enough, so I must try it soon. Enjoy following your room changes and look forward to more reveals. Thanks for your reply, Suzy. All considered, I think I’ll be happy with a reproduction as well. I love the look of your dough bowl. 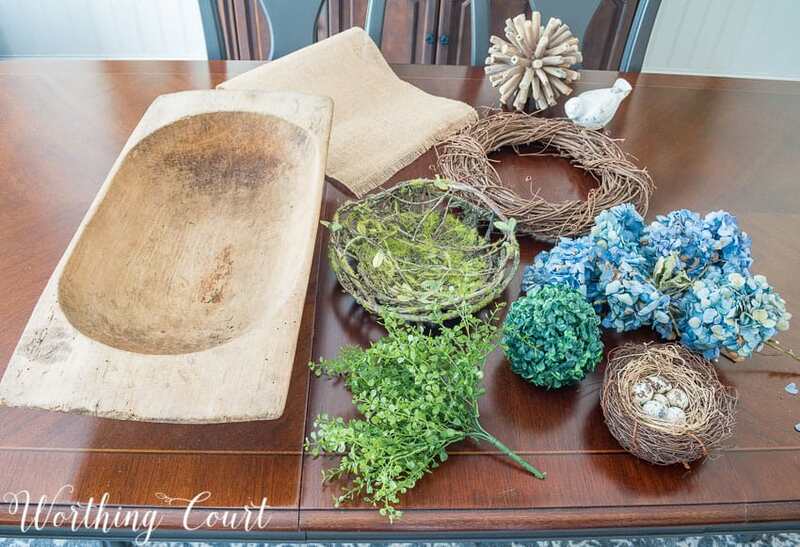 I love this centerpiece and the ease at which it came together. We have a lot cabin, and this would bd perfect for my kitchen table! On the lookout for my bread bowl. I’ve always wanted one, but not til now could I really use it. Thanks for the tutorial! Hadn’t found your site when this particular post was put on, but I’ve been searching for an affordable dough bowl for some months now! I loved your arrangement and thought: well, a THEME is an excellent way to fill one! Love this. Someday….hopefully, I’ll find one to my liking that I can afford! Hi Suzy! Just saw this on Pinterest! Do you have a source list anywhere for the items you used? Hi Shirlee. 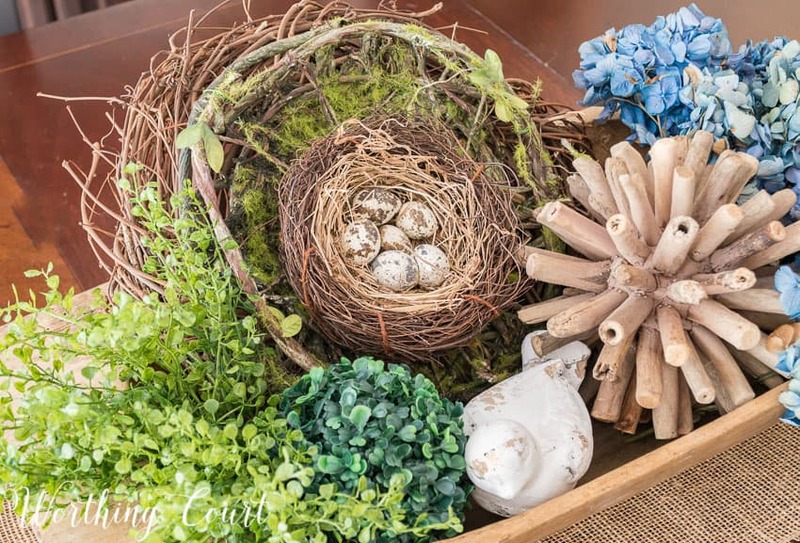 I know that the spikey orb came from West Elm, the twig wreath, greenery, boxwood orb and bird’s nests came from Hobby Lobby. The little white concrete bird was a yardsale find and the hydrangeas came from a local barn sale. Hope this helps! Still hunting for THE dough bowl for me! Love your arrangement tips. Love the layering in the dough bowl! 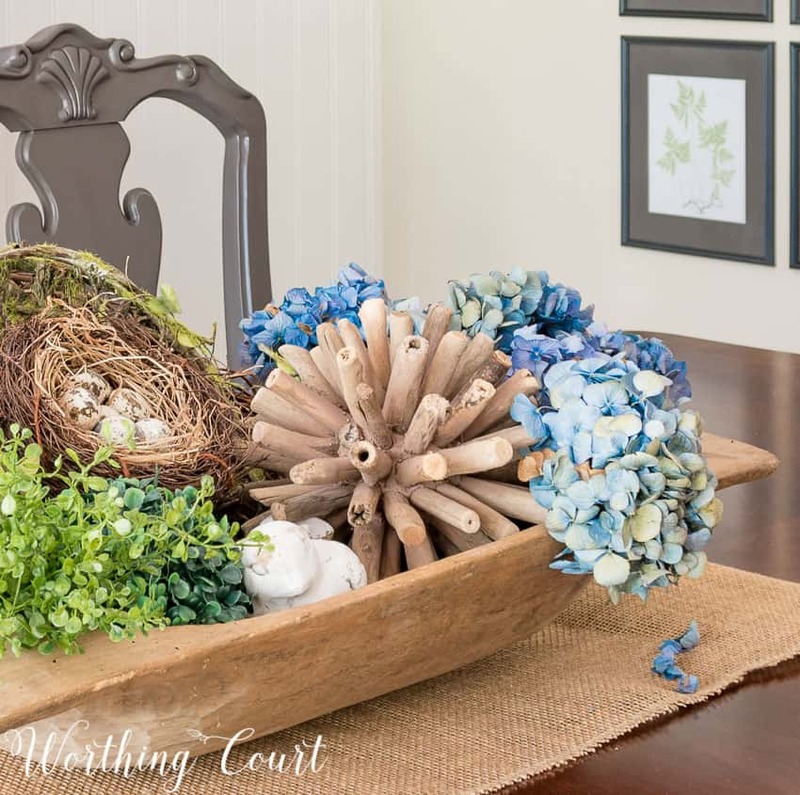 Love the wreath/nest idea in the bowl… this idea could definitely be year round, just change out the florals to whatever is in season! Hi, I live on NC. I have been searching for a dough biwl but unddure of what sized should purchase. Could you tell me how long and wise yours is? Thanks. Hi, I live on NC. I have been searching for a dough biwl but unsure of what size I should purchase. Could you tell me how long and wide yours is? Thanks. Love this! Can you tell me how big the bowl is and how big the wreath is? Just to get a perspective on size? I’m one of your new subscribers & I am so enjoying reading your posts! I love your style. I’ve been wanting to buy a dough bowl for a long time but haven’t because I didn’t know how I could make it look good. You have inspired me though, & I’m going to find a dough bowl & put together an absolutely amazing arrangement! Thanks you!